An exhibition of some of Adam Dant’s maps giving his unique view of our history and life today, to accompany publication of the book of the same name published by Batsford in conjunction with Spitalfields Life. Artist and cartographer Adam Dant surveys London’s past, present and future from his studio in the East End. Beautiful, witty and subversive, his astonishing maps offer a compelling view of history, lore, language and life in the capital and beyond. 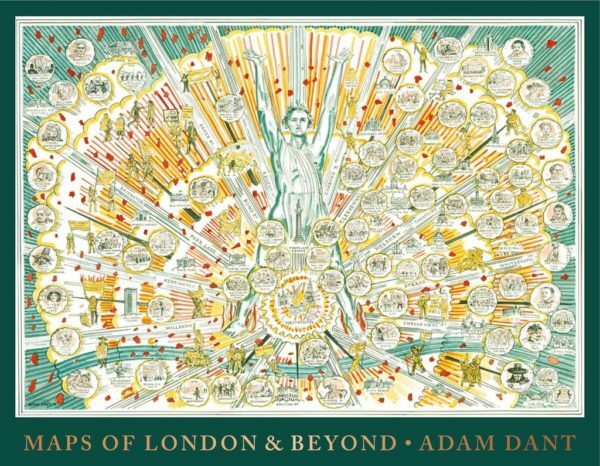 Traversed by a plethora of colourful characters including William Shakespeare, Charles Dickens, Mary Wollstonecraft and Barbara Windsor, Adam Dant’s maps extend from the shipwrecks on the bed of the Thames to the stars in the sky over Soho. Along the way, he captures all the rich traditions in the capital, from brawls and buried treasure to gin and gentlemen’s clubs. Adam Dant studied at the Royal College of Art, London and the MS University Faculty of Fine Arts, Baroda, India. He creates elaborate narrative drawings that examine and depict public contemporary life, space, mythologies and histories. Extensively researched and wittily perceptive, these works of art draw on a deep well of historical and visual sources. Adam Dant was the official election artist in 2015 and he lives and works in London. Doreen Fletcher arrived in the East End of London in the early 1980s and was immediately aware that the dilapidated buildings and small businesses in the streets around her were about to disappear. 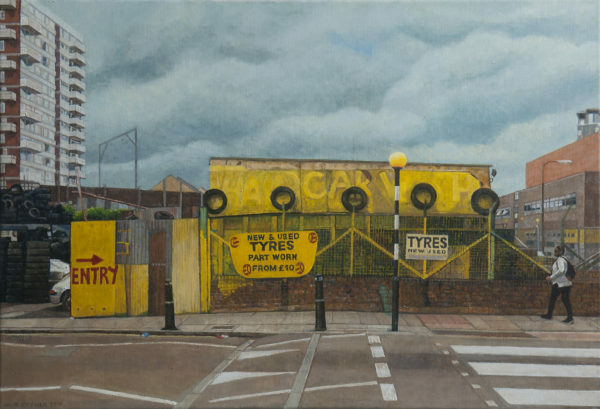 The sense of community in the area reminded her of her Midlands childhood and, inspired by the excitement of being somewhere new, she started a series of paintings of the East End that continued for the next twenty years. 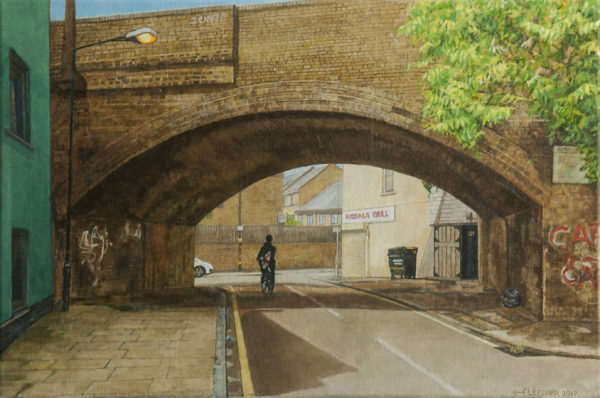 Aware that she was documenting an urban landscape that would be lost forever, she regularly contacted galleries and magazines to promote not only her paintings, but also an awareness of what was happening in the East End. The negative response reflected the wider attitude at the time and was the culmination of centuries of neglect of an area that had long been regarded as a vast slum. Dispirited by the rejections and the overwhelming changes to the area, Doreen put all her work in the attic and stopped painting in 2003. A chance contact put Doreen in touch with the the Gentle Author of Spitalfields Life and her paintings were featured on the blog, leading to a storm of interest and the near sell-out exhibition here at Town House in June last year. 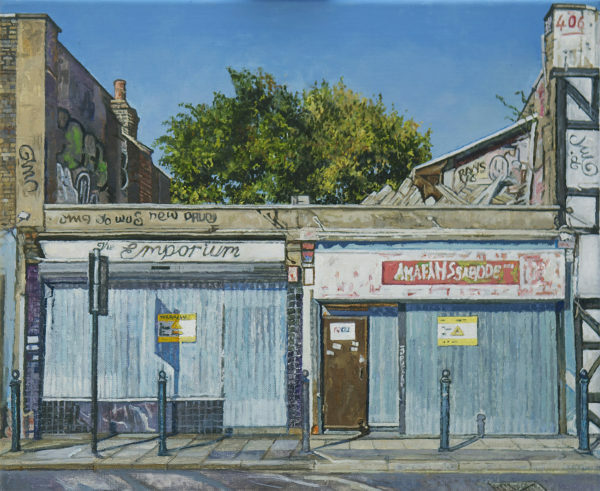 The sudden interest in Doreen’s work prompted her to start painting again and the latest work, retracing her East End footsteps, reveals how much of the area remains an edgeland balanced between demolition and regeneration, between past and future. It is an intensely human landscape that forms the essential backdrop to the lives of people still struggling to find their place in a built environment that is rapidly changing: an edgeland in between. Gathered is simply about the beauty and joy of flowers and plants. Whether the picture is of a single stem of blossom, a detail of trailing clematis, or a bunch of Icelandic Poppies, these glorious photographs demand contemplation and stir the emotions – sometimes in an unexpected way. Some of the images are very simple, with no narrative, and the emphasis purely on colour and shape. 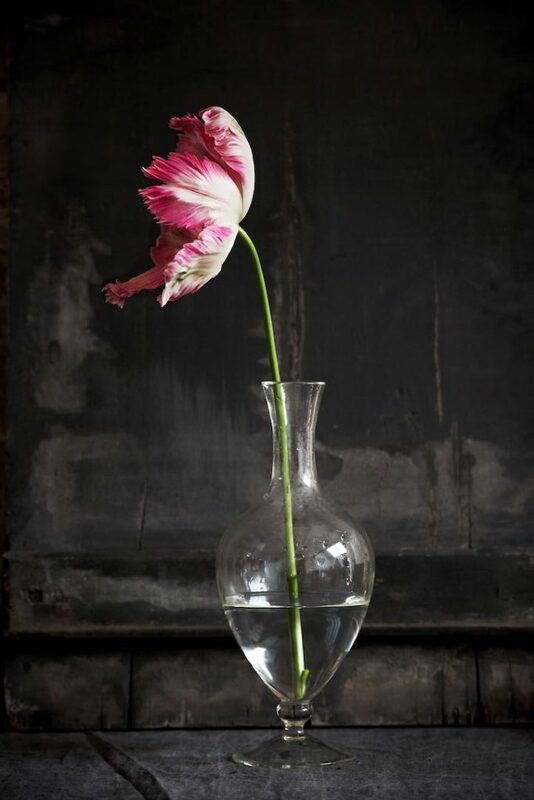 In others, the flowers are arranged with props and backgrounds, or put in surprising spaces that exaggerate or contradict the spirit of the plant. Polly Wreford, photographer, and Mary Norden, art director and stylist, share a passion for flowers, and for making beautiful images of them. To create this exhibition and accompanying book, they collaborated for over a year, photographing flowers that Mary had growing in her garden in East London. Limited Edition Prints available (both framed & unframed). 64pp book available during Gathered at the special price of £19.50 with all the images from the show plus more, published by Us Publishing. 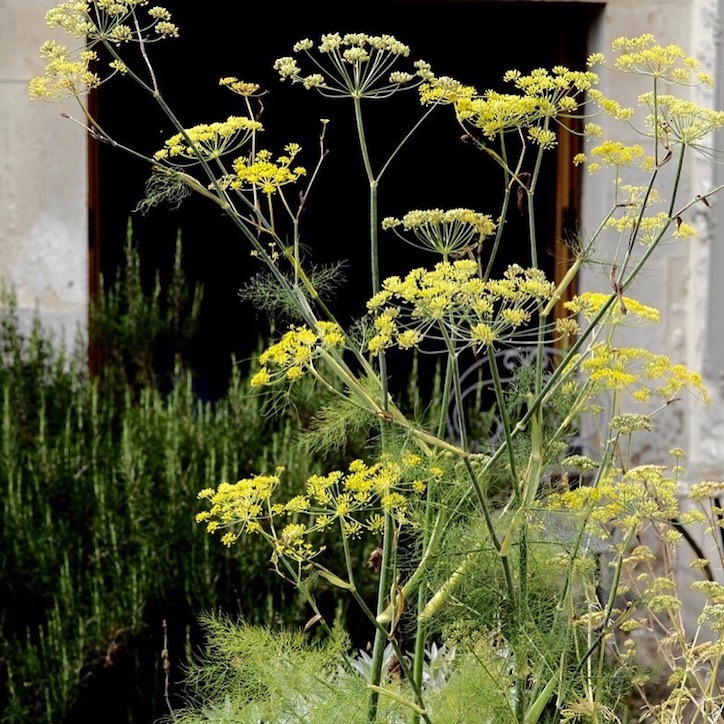 A workshop in which plantsman and perfumer Stephen Nelson will discuss the shared disciplines of the perfumer and the gin maker – distillation, blending and composition – and will give a potted history of London’s early perfumery and distillery trades and the supply of herbs and spices for it. You will be able to sample and compare some ‘elixirs’ and perfumes with Stephen, considering the structure and common notes in each and each participant will get the chance to blend some botanicals and essences to take home. This can either be in the traditional form of a sachet powder to scent a space in the home or it can be a blend to make a botanical gin. Each of the audience will choose their own ingredients for whichever they choose with help and direction from Stephen, for example: angelica, cardamom, citrus peel, juniper, liquorice, lovage, orris, rose or tonka bean. All ingredients and materials will be supplied (but not including the vodka/gin base required for the maceration at home!). Cost: £15.00 to include materials, tea and home-made cake, tickets limited to two per person. 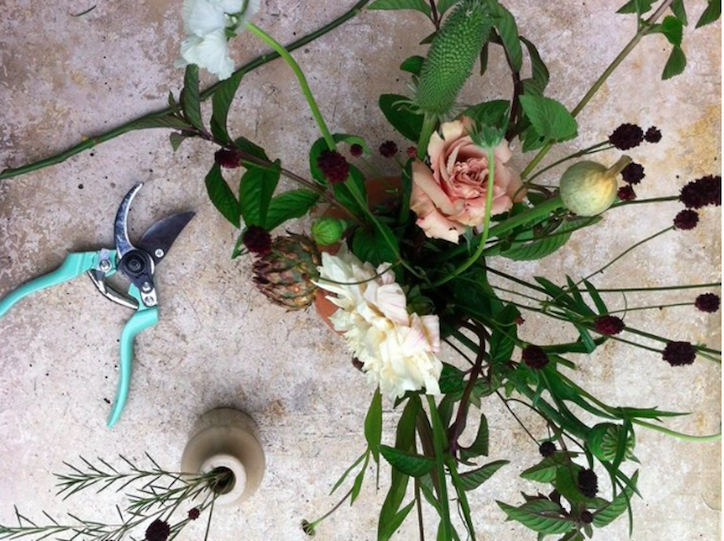 Join us in the beautiful 18th century surroundings of Town House Spitalfields for this creative floral workshop in which we’ll be celebrating the coming of summer, using colourful and seasonal British flowers for the table arrangements you’ll be making. You will learn all you need to know about choosing and preparing your flowers, plus some tricks on how to make an interesting arrangement. Everyone will make their own piece to take home with them in vintage, ceramic marmalade jars and we hope you’ll leave inspired by the arrival of the summer flowers and your new skills to continue what you’ve learnt at home.